We provide reliable, high-quality VHS to AVI or QuickTime video tape conversion. 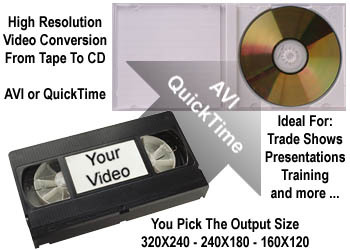 Whether you have a 30 second TV commercial to convert or a 15 minute video taped presentation, we can digitize your video tape into your choice of AVI or QuickTime format and write it to CD. Regardless of the type or length of content, we can convert it into AVI or QuickTime format usually within 24 to 48 hours. When you choose CyberTech to digitize your video tape, you'll be guaranteed to gain all of the benefits of digitized video without any of the headaches or heavy expense. We can even produce your video to the size specifications you desire - from 160X120 to 320X240. If you plan on stretching your video to a larger size, or even full screen during playback, you'll want to select the initial size of 320X240 as your resolution will be greater after you resize your viewing window. To have your video digitized and written to CD, please submit your video to us using our mail-in submission form. If you have any questions or would like to discuss digital video further, please call us at 630-690-7611 or E-mail us at cybertech@ameritech.net. If you also have a need to place your digital video on your web pages or Corporate Intranet, we can also digitize it into your choice of Vivo, Real Video or Microsoft NetShow formats. Please visit these pages for additional information and actual examples. If we can answer any questions, please call us at 630-690-7611 or E-mail us at media@cybertechmedia.com.